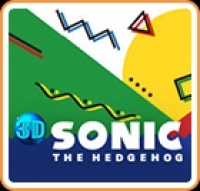 Box Text: Sonic The Hedgehog, now in 3D! The evil scientist, Dr. Eggman (aka Dr. Robotnik), has snatched the animals of South Island, turning them into robot slaves. Only one hero can defeat Dr. Eggman and rescue the animals from his vile clutches – it’s the super-cool hedgehog with the blue spiky hair, Sonic! In addition to its all-new 3D presentation, 3D Sonic The Hedgehog™ now features Zone Select and the classic Spin Dash move to help you zoom through Zones and take down Badniks! 04-08-2015 desocietas Box Text Sonic The Hedgehog, now in 3D! The evil scientist, Dr. Eggman (aka Dr. Robotnik), has snatched the animals of South Island, turning them into robot slaves. Only one hero can defeat Dr. Eggman and rescue the animals from his vile clutches – it’s the super-cool hedgehog with the blue spiky hair, Sonic! Race at lightning speeds across seven classic zones as Sonic the Hedgehog. Run and spin through loop-de-loops as you collect rings and defeat enemies on your mission to save the world! In addition to its all-new 3D presentation, 3D Sonic The Hedgehog™ now features Zone Select and the classic Spin Dash move to help you zoom through Zones and take down Badniks! This is a list of VGCollect users who have 3D Sonic The Hedgehog in their Collection. This is a list of VGCollect users who have 3D Sonic The Hedgehog in their Sell List. This is a list of VGCollect users who have 3D Sonic The Hedgehog in their Wish List.